By the time Eid-ul-Adha arrived in Dhaka in late August of 2018, a lot of water has passed through the nozzles of Hatirjheel fountain, wowing the spectators enjoying their Eid Day joyrides. In the not so distant past though, there were a few days of something different, something that could be forgotten in the dancing lights of the fountain show. 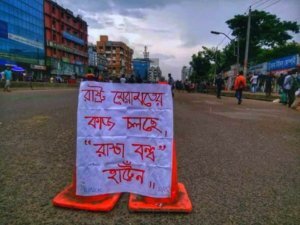 So what did happen in the August Revolution by students in Dhaka? Interesting to note how August is a month of revolution throughout history. There is something about summer and the warmth of the sun that allows passions to overflow, actions to be taken. But who are we kidding? In Bangladesh the heat in August is hardly any different than that of any other time in the year. Perhaps it was the rain then? The thunders and torrents of the monsoon which gives strength to the hearts of the young protesters? No, it was nothing of that sort. 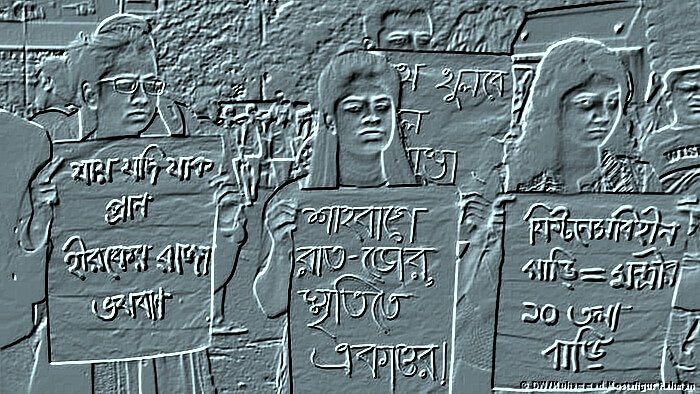 The August Revolution, rather the August petiteRevolution, was the conscious doing of the next generation of Bangladesh. And it is only the beginning. 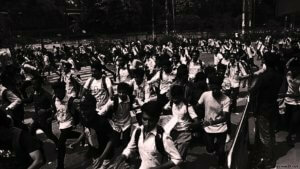 The school-uniform clad young protestors of this revolution showed enormous moral strength and good conscience. This wasn’t about violence or destruction. They set about changing the society with friendship and comradery. Who can forget the school girl who shared her packet of potato chips to the many ‘Rickshawala mama’ waiting in the traffic lines they created? Hundreds, if not thousands of students of so many educational institutions organized sit downs, marches, blockades and how much was destroyed? Nothing compared to any two-hour political protest rally organized by the mainstream political parties in the last decade. Still Nothing compared to the one day in May 2013 when the Islamists had their sit in in central Dhaka. The students engaged in public speaking, in debating what they were doing, and through posters telling us how we have failed them and the country. They did not differentiate between an ‘elite-school’s student’ and an ‘average-school’s student’. They didn’t harass their female compatriots of other schools. They swept the roads, cleared pathways for ambulances, and helped travelers to reach their stations. Young girls stood in torrential rains and trafficked the roads to give respite to Dhaka commuters from the madness that is Dhaka traffic jam. No one asked them to do this. Their actions, as well that of the entire cohort of this petiterevolutionaries, came from a moral obligation, a duty. The petiterevolutionaries took to the roads to keep the children safe. The political awakening of this moral generation is truly an important moment in the history of Bangladesh. It’s long road to freedom since the Sultanate period against the Mughals, long before the British colonial days, is witness to the victory of morality and humanity over dark oppressing regimes. The people of this land have initiated, organized, and participated in many political protests throughout the history, and their youngest generation continue to do so. But they do it with this morality, this sense of civic responsibility – something which we have not seen in decades. The young revolutionaries invoked the protestors and martyrs of the language movement, of the liberation war, and even Bangabandhu himself. These invoked heroes are our role models and will always be, and what a beautiful sight it is to see that our young generation not only idealize them but also uphold their spirit of freedom, moral duty and civic responsibility to the people. The future of Bangladesh is in good hands if it is with people like the petiterevolutionaries. During the days of attacks at private universities, the social networks of the upper middle class and the elites were full of news of harassment and arrests of their own – his nephew, her third cousin and so on. The rich called up favors among their friends in the security world, and showed up at police stations (with a full wallet without a doubt). Among hundreds of students who were initially taken to police station, in the end only 22 ended up in jail. The others didn’t walk free just because. While the rich were able to use their wealth and influence to protect their own, as they have always managed to do, this time they felt the crackdown too close to their skin. Panic ensued again among this group when news spread of police block-raids in Bashundhara residential area, a moderately upscale neighborhood with at least two major universities and equally large student population. People shared that the raids allegedly included a house searches and checks of social media activities of the youngsters. The anger among the rich was visible from their Facebook posts, some of whom considered this as an attack on their homes, their private lives. Bangladesh is a place of struggle, and the pursuit of daily life is that of struggle. The rich shelter themselves from this crazy world by building a nest of luxury and comfort behind the walls of their residence, often guarding it with private security and CCTV. They felt that this sanctity was now being breached by the authorities – people who are often not considered as equals by the upper class they were intruding upon. Some went as far as comparing this breach of social hierarchy to the house-to-house attacks by the Pakistani Army in 1971. Post-revolution schools called up parents and threatened them with expulsion of their children from these institutions if they had not returned to classes. This was done at the behest of the government Education ministry as a state response to bring about normalcy. It takes a lifetime of efforts to get into these elite schools in the capital, an expulsion from which could severely derail the life and career of these young students, so no doubt the parents capitulated to the commands. This end of the revolution was brought by pure coercion, in its 21stcentury form. But also in this manner, the parents became involved in this protest trying to protect their own. The attacks on the children were shielded by their parents. Many in the upper-middle class affected by this petiterevolution will remember this as an intrusion into their cocooned private life and this will invariably make them think and ask questions about the politics of the country. They have normally mastered the lifestyle of not being present in Bangladesh but still living in it. Difficulties, struggles, especially those that deals with politics and its repercussions had been left to the people that were not doing very well – socio-economically speaking. The upper-middle class, with its money, network, knowledge and resources, was away from Bangladeshi politics, perhaps for over two decades now. This incident will lead to an awakening within this very important demographic of the country who have the power to make change. While it is very much possible that this group of people go back to their cocoon, which probably is what we already see, it is unlikely that they will forget this anytime soon. Throughout Bangladesh’s 20thcentury history of political struggle, the public universities have played a key role. Especially in the Pakistan period, student leaders from these educational institutions have planned, organized and carried out political protests, demonstrations and movements. The contribution of the students of these institutions in the Language movement, the politically tumultuous decade of then 60’s and Bangladesh Liberation War is immense. Once there was a saying that no political movement, which does not have a base in Dhaka University, can succeed. In the post-war period though, student politics in the universities started to change. During the autocratic regime of President Ershad the student leaders were lured into a different kind of politics, with money and weapons being poured into them. In the years since then, student politics around the country has become incredibly toxic, almost all becoming nothing more than a loosely organized group of lackeys and thugs, a synonym to violence and conflict. The weapons-wielding cadres of public universities killed the political ideals of the pre-Independence days. With arrival of private universities in the 21stcentury, things did not change at first. In fact, private universities were preferred by parents and students alike because they banned all kinds of political groups. In the absence of the toxic influence of these groups, students in the private universities engaged in other forms of activities in the business sector or the arts. These private universities provided the perfect cocoon for the upper middle class in Bangladesh to hide away from Bangladesh. But clearly that is no longer that case. These universities, whose original intention may have been to make their students shy away from their society, has become a bastion of social debate and movements. Starting with non-political activities and groups, these students have invariably asked the questions they were not supposed to ask – how is our politics? While political groups still are not allowed to operate in most of these private universities, their students no longer shy away from the political issues of the country. Their latest engagement with the petiterevolutionaries just show it. With the disproportionate amount of force exerted on them by the law enforcement agencies, the students have only been baptized for political engagement that is bound to happen. And these students are far more capable and resourceful than any other student group that ever existed in the country. Their political awakening will have a lasting impact on Bangladesh. The rise of ‘the awoke’ – people who have politically woken up in Bangladesh follows a global trend. It is only expected from a global generation who are as close to their cousin in Toronto as their friend in Taltola. This participation in the global village is not only in terms of media and entertainment consumption. The petiterevolutionaries have showed us that they learn from world affairs. They follow not only entertainment or fashion trends but also social and political activism from their global counterparts. They also showed that when push comes to shove, the young people in Bangladesh don’t stand alone. When the crackdown came upon them the petiterevolutionaries didn’t appeal to the UN or write letters to foreign governments for their intervention. In a quintessential 21stcentury way, they called up their fellow media warriors. Within a short span of time, YouTube vloggers, Facebook megastars and other new media celebrities around the world were sent thousands of messages, often with photos and videos of the crackdown, by the protesting children. To many people in Bangladesh who are, let’s say over 40 years old, this method would not make sense. But this is the new way of communicating, and is the daily life of the young people in this global world. Their efforts were successful, and the cavalcade of world attention arrived through new media. Social media celebrities around the world, with millions of their own followers, started sharing the appeal of the Bangladeshi petiterevolutionaries. The children got the amount of global attention that the Bangladesh government can never even imagine to achieve with their own PR mechanism. As a result, Bangladeshis or Bangladeshi-origin individuals, or even just Bangla speakers around the world became engaged in this revolution. The plight of the children reached them, the attack on the children moved them. The global Bangla diaspora, some more so than others due to their political allegiance, protested along with the protesters in Dhaka. They organized marches on the streets of various capitals, conducted démarche with their local Members of Parliament, while raising placards stating “We want Justice”. In doing so, they have ushered in an era, where Bangladeshi politics will no longer be only local. The repercussions of political decisions and actions in Bangladesh will be felt around the world. The global Bangla diaspora will more and more engage in this ‘dance of politics’, not only bringing their own governments with them, but also through the other, more nuanced channels such as socio-economic and cultural assets. The War of Independence in 1971 was a watershed moment for Bangladesh. The importance of this cannot be overemphasized. But such an immensely important moment also bound the nation to it. Unable to move forward, Bangladeshi politics since ’71 has been all about ’71. Try to explain the politics in the country to someone who is new, you have to start at ’71. What happened in that tumultuous year, influences us to this day in our national policy making. The doyens of ’71 are still the ones calling the shots in Bangladesh, from the cabinet in power to the bureaucrats, technocrats and civil and military service personnel. They all have experienced ’71. This means that Bangladeshi politics today considers the actions and reactions of ’71 and responds that way. It means that whether or not your parents or grandparents participated in the war decide your access to resources. It means that the best way to negate a person’s life-long work in arts and culture is to portray him as the nephew of a war-criminal from ’71. The rising leaders who will come out of this August petiterevolution will perhaps be the generation who would have the chance to look forward. Born and growing up in a Bangladesh that is very different from ’71 and the succeeding years; born and growing up in the post-poverty Bangladesh, these new leaders – the 18’s at ’18 – will have unbound imagination – to find new ways, new solutions, new norms. The early experience of this political awakening and the succeeding experience of their actions will only help them to prepare for their long and active political lives ahead. Echoing some of the petiterevolutionaries, generation ’71 might be the nation emancipators, but generation ’18 would be the nation builders. For the first two decades of the life of the new Bangladesh, it reeled from the sufferings and backlashes of the Liberation War. Only in around the 90’s did Bangladesh see the much awaited economic growth and progress. With development in motion, Bangladesh in the past two decades have been in search of its identity. This became acutely visible in the 21st century as Bangladesh claimed its place in the global world. What is Bangladesh? Is it a secular democracy, is it a moderate Muslim nation, is it a middle income country – were questions with unclear answers. What meant to be a Bangladeshi in this global 21stcentury – would need a lot of soul-searching before an answer could be found. Now the answer is in front of us – the petiterevolutionaries are the answer for Bangladesh’s search for its identity. This moral, resourceful, globally engaging, forward-looking generation of leaders will write the next chapter of Bangladesh. We have only seen the beginning. The ‘August petiteRevolution’ was the greatest manifestation of people’s democracy in a very long time. Postscript:Over a few days before the Eid most of the 22 imprisoned students of various universities were released. The media was awash with images of the happy faces of their relatives. Such a joy! The nation couldn’t thank enough its rulers for giving them such unbound joy! It is midnight in Dhaka, and all is well. Asheque Haque is a King’s College London graduate in South Asia and Global Security. He is a violent extremism researcher. He can be reached on Twitter @ashequeh.